1 What is kung fu if not physics? 5 How much energy do we need? Convert GPE to KE! 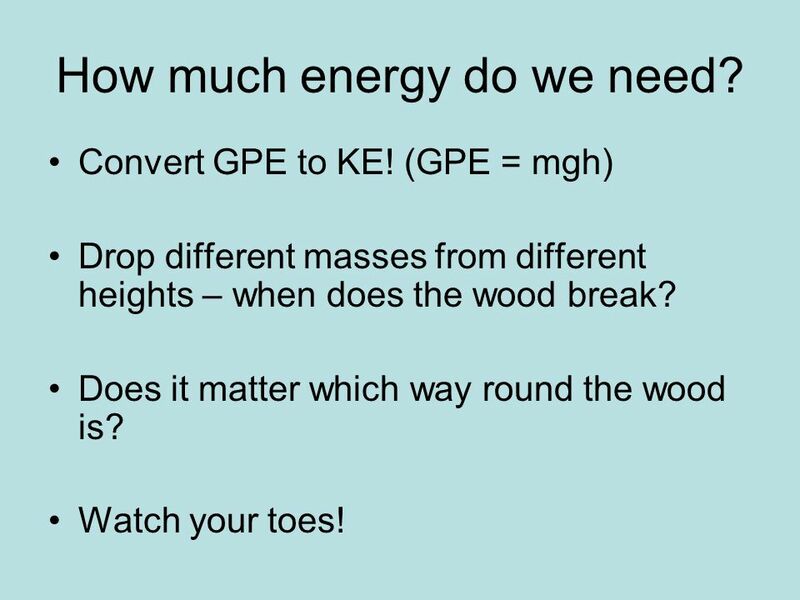 (GPE = mgh) Drop different masses from different heights – when does the wood break? Does it matter which way round the wood is? Watch your toes! 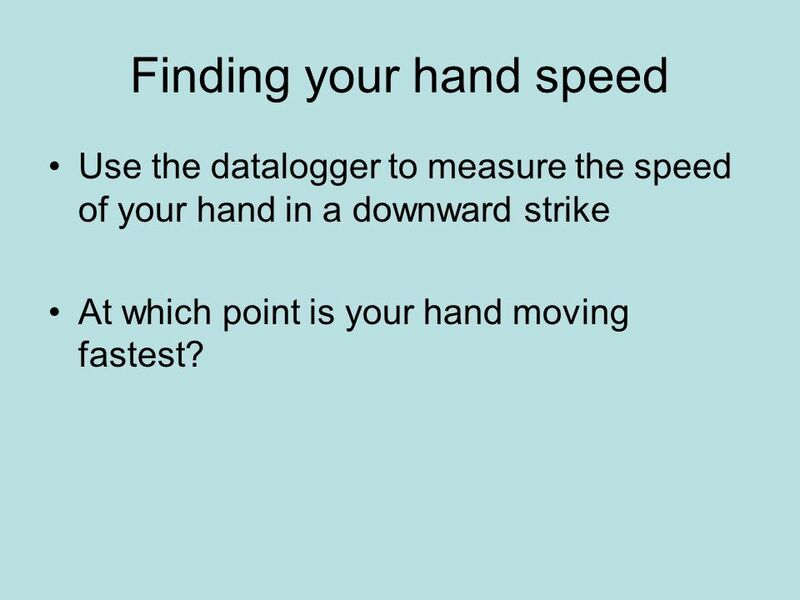 6 Finding your hand speed Use the datalogger to measure the speed of your hand in a downward strike At which point is your hand moving fastest? 9 Whats the maximum KE of your hand? 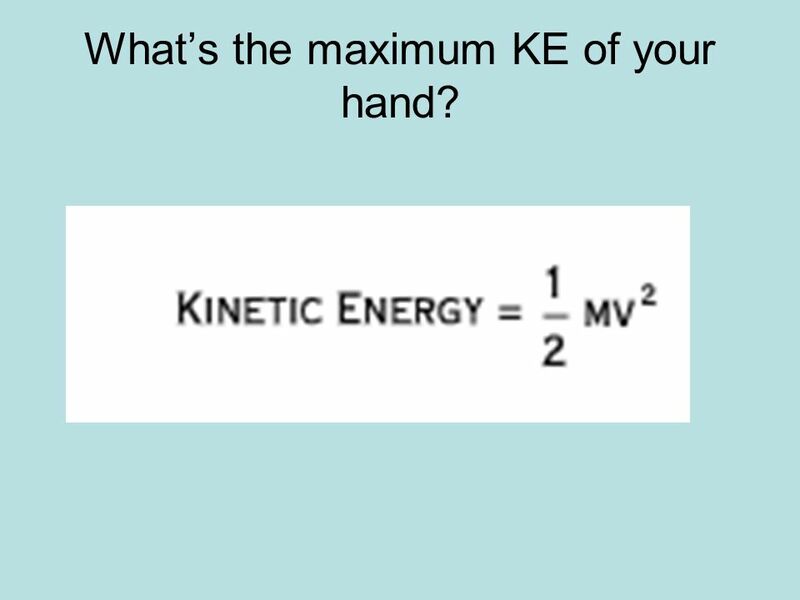 10 Conservation of energy: KE of my hand before the break equals the energy that goes into breaking the board (called the deformation energy) and kinetic energy of the hand and the board after the strike Where M= the mass of my hand and forearm, Vo = velocity of hand at point of impact, m = the mass of board, V = velocity of hand and board after impact. 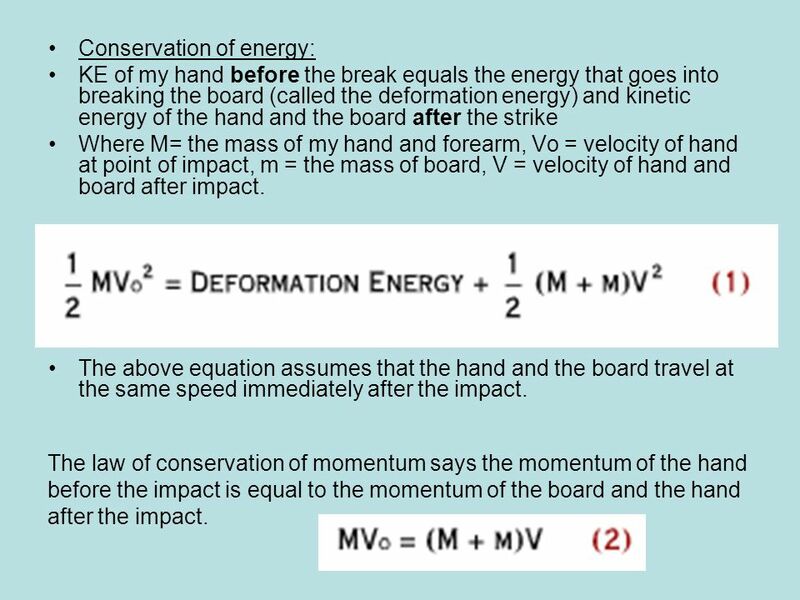 The above equation assumes that the hand and the board travel at the same speed immediately after the impact. 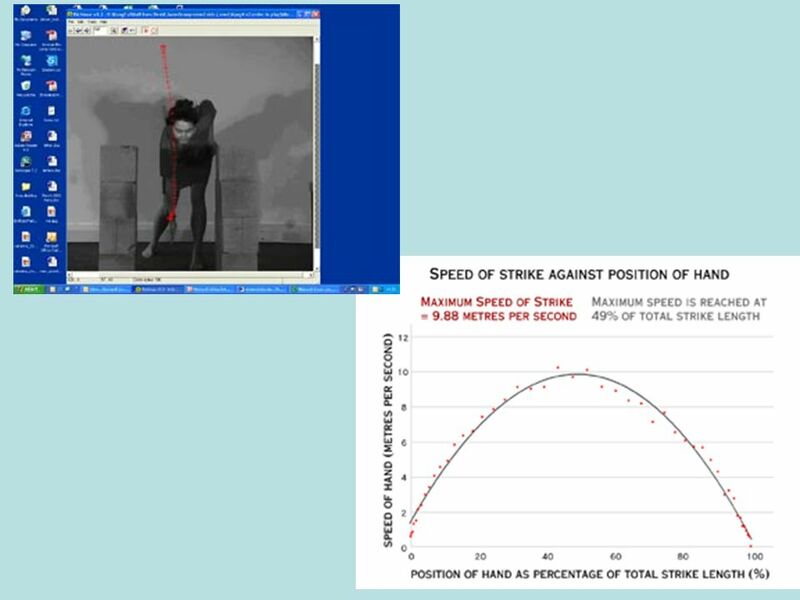 The law of conservation of momentum says the momentum of the hand before the impact is equal to the momentum of the board and the hand after the impact. 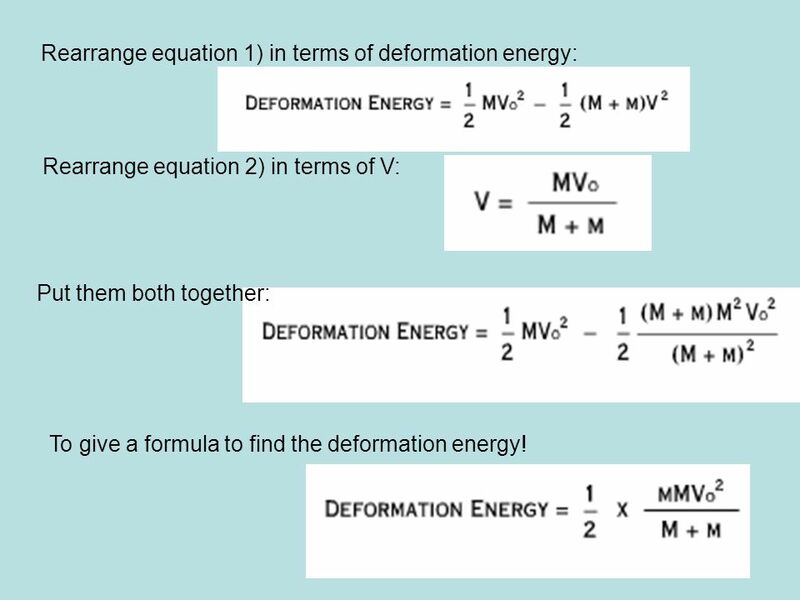 11 Rearrange equation 1) in terms of deformation energy: Rearrange equation 2) in terms of V: Put them both together: To give a formula to find the deformation energy! 12 How much energy do we need? 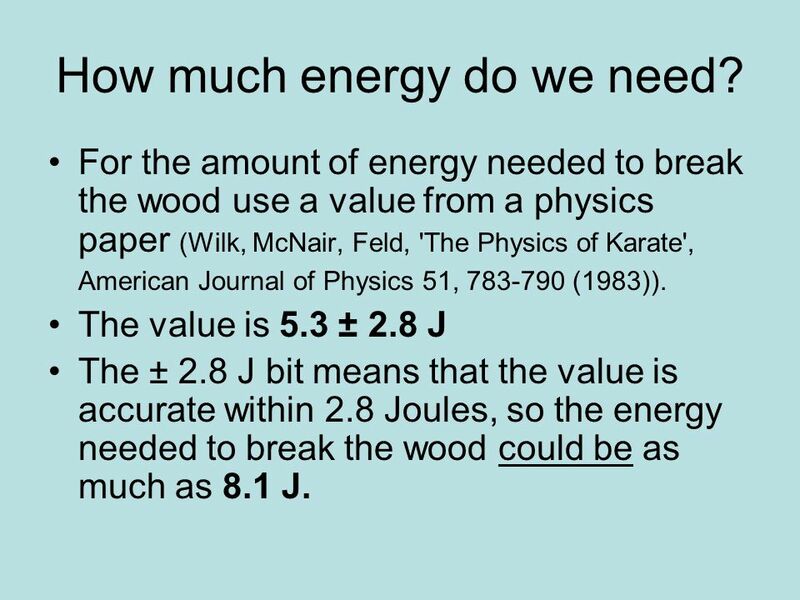 For the amount of energy needed to break the wood use a value from a physics paper (Wilk, McNair, Feld, 'The Physics of Karate', American Journal of Physics 51, 783-790 (1983)). 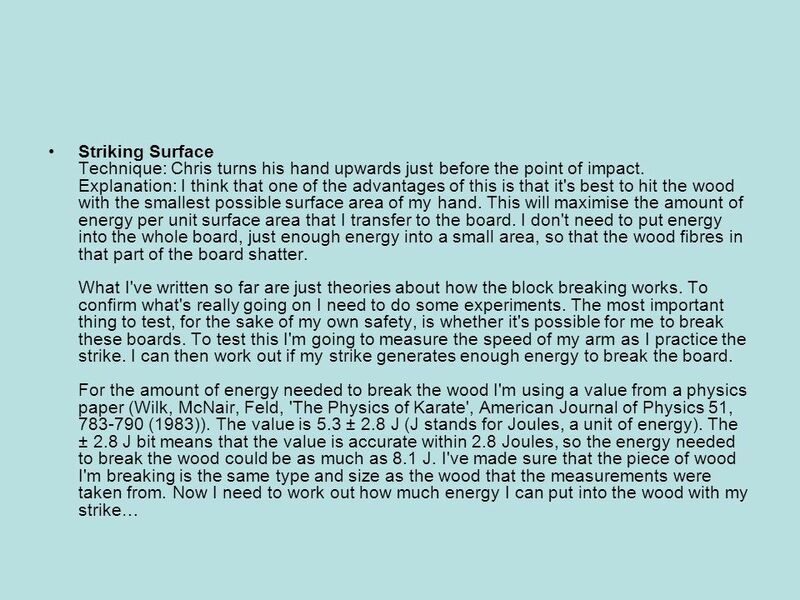 The value is 5.3 ± 2.8 J The ± 2.8 J bit means that the value is accurate within 2.8 Joules, so the energy needed to break the wood could be as much as 8.1 J. 13 Can it be done (theoretically?) 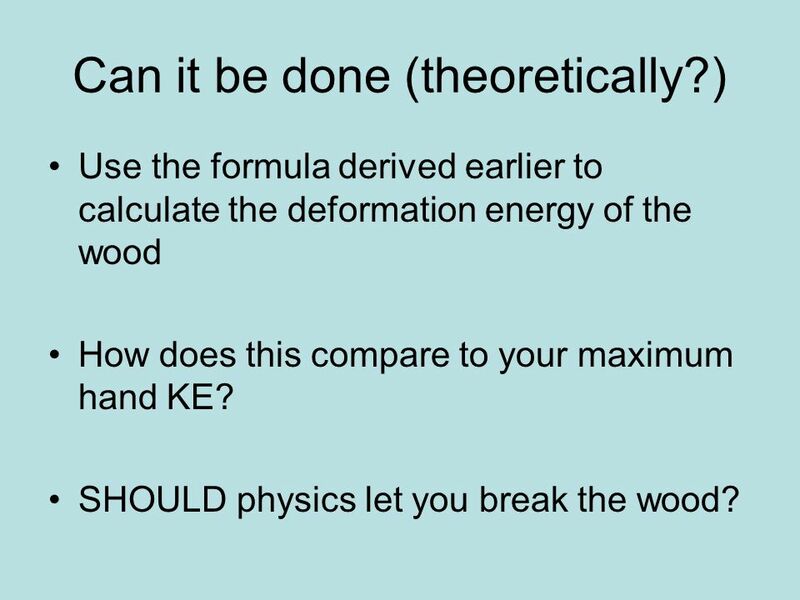 Use the formula derived earlier to calculate the deformation energy of the wood How does this compare to your maximum hand KE? SHOULD physics let you break the wood? 15 The need for speed From what Chris tells me, the most important thing is to make sure my arm is moving at the maximum possible speed when it hits the board. 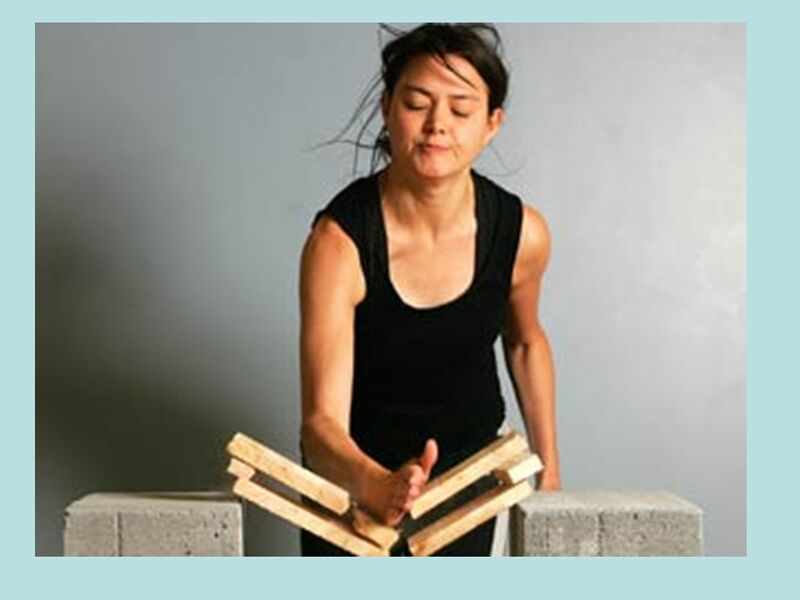 This seems kind of obvious, but what worries me is this: I've tried pushing down on the wood as hard as I can and I can't break it, so why will I be able to break it just because my hand is moving? 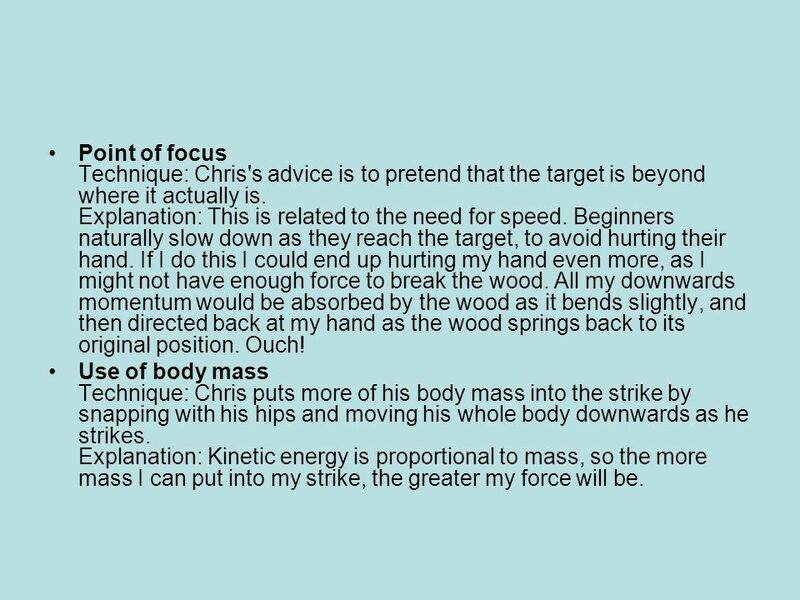 Luckily, Chris's advice does make sense from a physics point of view. It's all about Force. A force is a push or a pull that can speed something up, slow something down or change its direction. When I move my hand very quickly for a strike, the wood (which is rigid) must exert a force on my hand to slow it down. Because the wood is brittle and does not bend or compress very much, it has to do this very quickly. 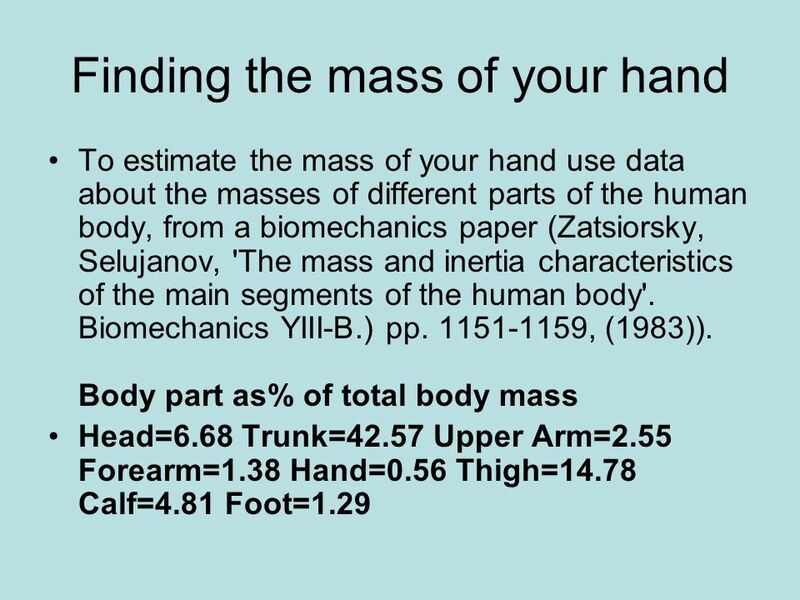 To slow my hand down in a fraction of a second means there is a very large deceleration and a very large force acting on my hand. 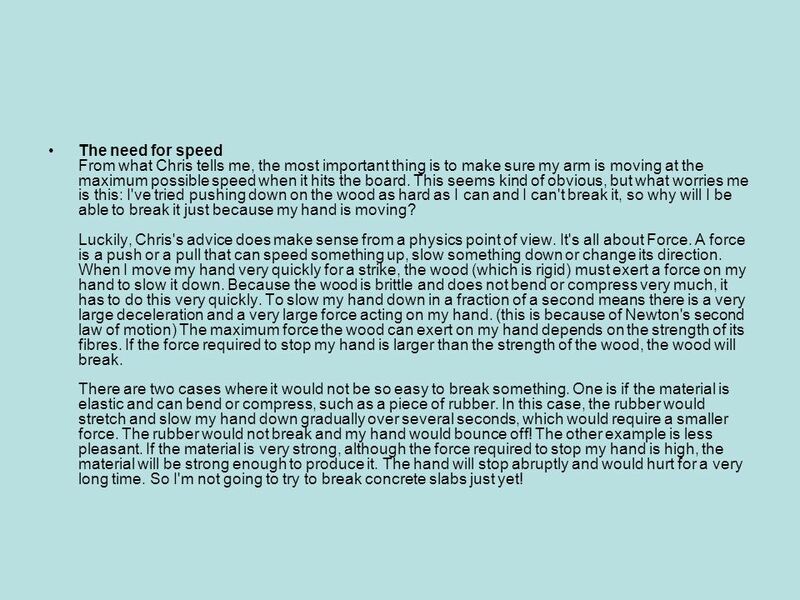 (this is because of Newton's second law of motion) The maximum force the wood can exert on my hand depends on the strength of its fibres. If the force required to stop my hand is larger than the strength of the wood, the wood will break. There are two cases where it would not be so easy to break something. One is if the material is elastic and can bend or compress, such as a piece of rubber. In this case, the rubber would stretch and slow my hand down gradually over several seconds, which would require a smaller force. The rubber would not break and my hand would bounce off! The other example is less pleasant. If the material is very strong, although the force required to stop my hand is high, the material will be strong enough to produce it. The hand will stop abruptly and would hurt for a very long time. So I'm not going to try to break concrete slabs just yet! 16 Point of focus Technique: Chris's advice is to pretend that the target is beyond where it actually is. Explanation: This is related to the need for speed. Beginners naturally slow down as they reach the target, to avoid hurting their hand. 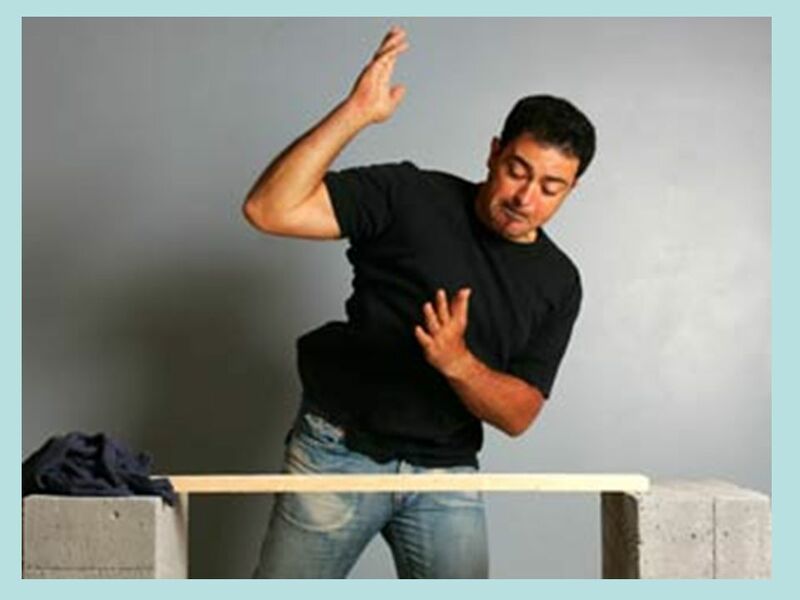 If I do this I could end up hurting my hand even more, as I might not have enough force to break the wood. All my downwards momentum would be absorbed by the wood as it bends slightly, and then directed back at my hand as the wood springs back to its original position. Ouch! Use of body mass Technique: Chris puts more of his body mass into the strike by snapping with his hips and moving his whole body downwards as he strikes. Explanation: Kinetic energy is proportional to mass, so the more mass I can put into my strike, the greater my force will be. 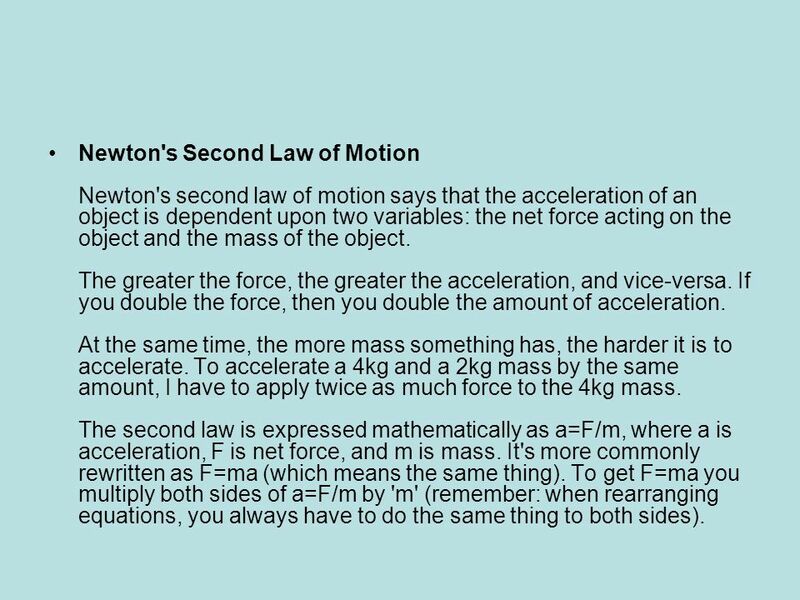 18 Newton's Second Law of Motion Newton's second law of motion says that the acceleration of an object is dependent upon two variables: the net force acting on the object and the mass of the object. The greater the force, the greater the acceleration, and vice-versa. If you double the force, then you double the amount of acceleration. At the same time, the more mass something has, the harder it is to accelerate. To accelerate a 4kg and a 2kg mass by the same amount, I have to apply twice as much force to the 4kg mass. The second law is expressed mathematically as a=F/m, where a is acceleration, F is net force, and m is mass. It's more commonly rewritten as F=ma (which means the same thing). To get F=ma you multiply both sides of a=F/m by 'm' (remember: when rearranging equations, you always have to do the same thing to both sides). 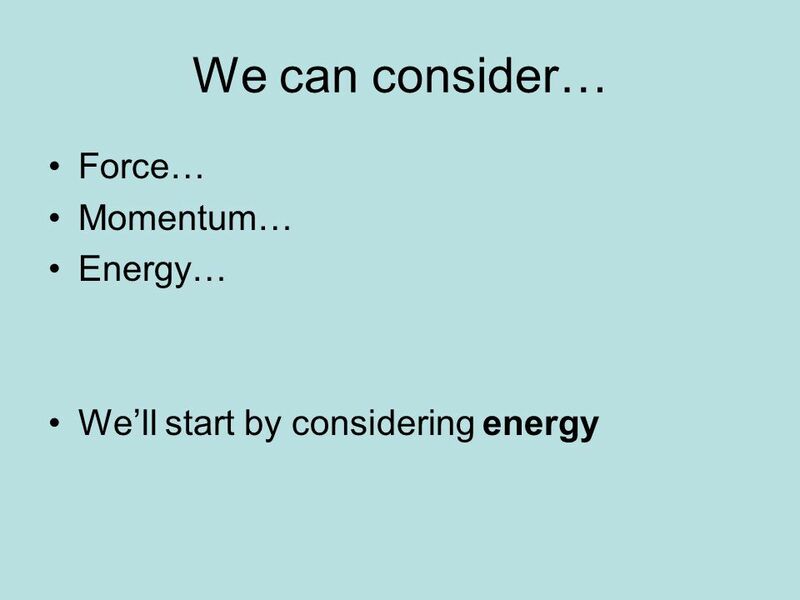 19 Conservation of Energy An alternative way of thinking about the strike is in terms of energy. Energy is a measure of how much work something can do. Work is done when a force causes an object to move. One form of energy is kinetic energy: the energy something has due to its motion. The equation for the kinetic energy of my hand is: Where m stands for the mass of my hand, and v stands for it's speed. Energy is always conserved. 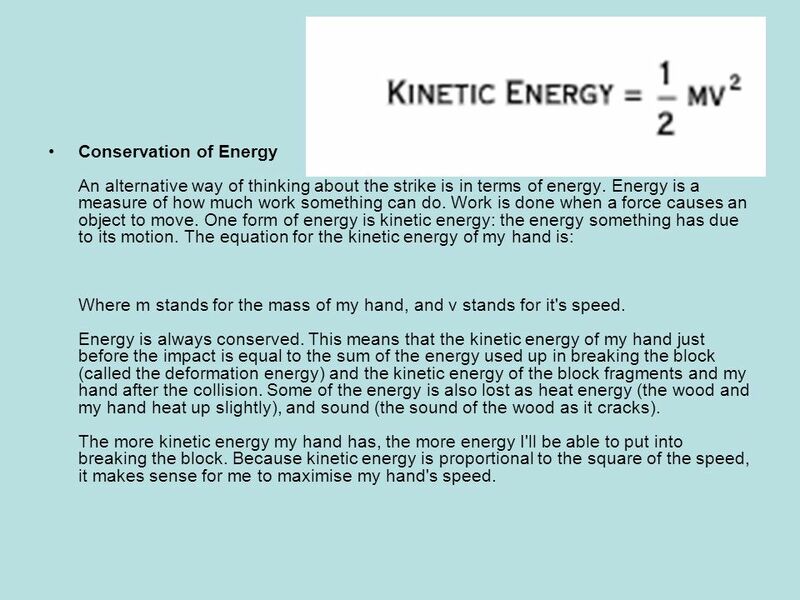 This means that the kinetic energy of my hand just before the impact is equal to the sum of the energy used up in breaking the block (called the deformation energy) and the kinetic energy of the block fragments and my hand after the collision. Some of the energy is also lost as heat energy (the wood and my hand heat up slightly), and sound (the sound of the wood as it cracks). The more kinetic energy my hand has, the more energy I'll be able to put into breaking the block. Because kinetic energy is proportional to the square of the speed, it makes sense for me to maximise my hand's speed. 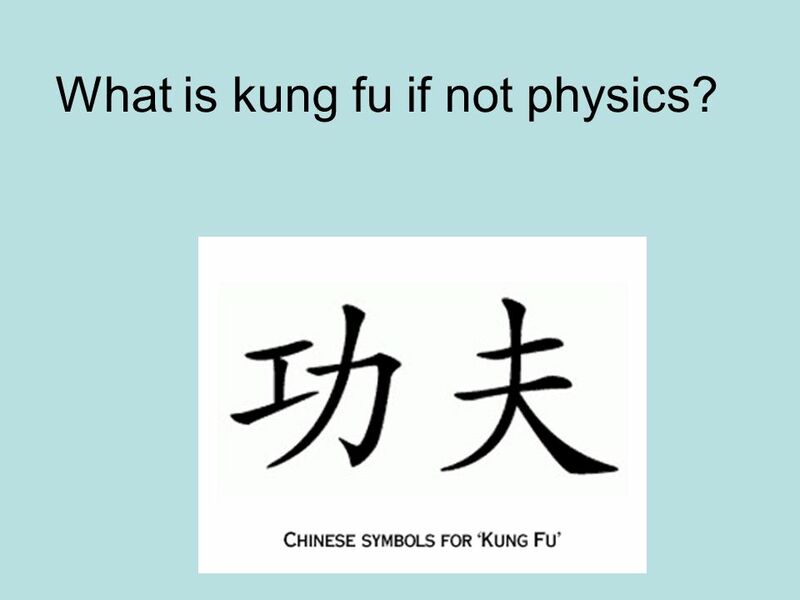 Download ppt "What is kung fu if not physics?. How is it done? 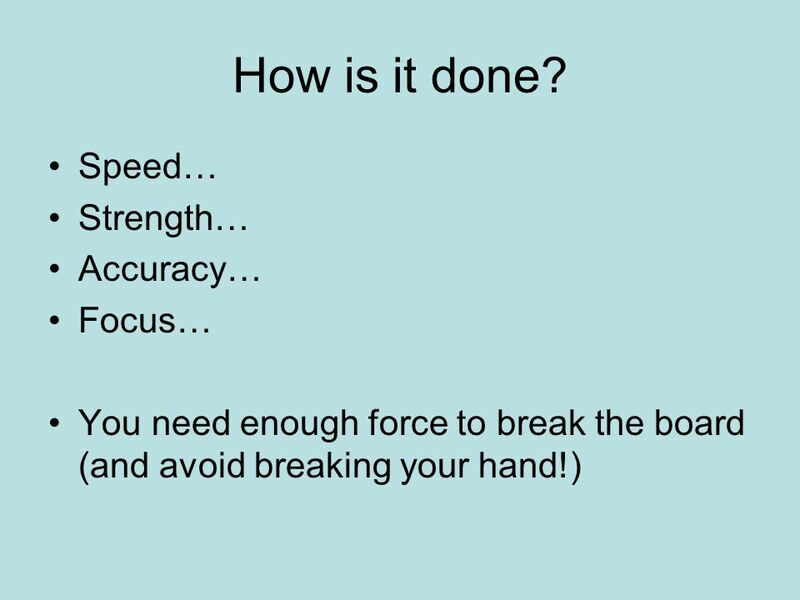 Speed… Strength… Accuracy… Focus… You need enough force to break the board (and avoid breaking your." Chapter 9 Work and energy. F As a rocket accelerates it experiences a force F which is responsible for the acceleration. The reaction force to this force F (the other force in the. What is Energy? The ability to do work –The ability to create a change Energy comes in many forms –Mechanical Potential Kinetic –Electrical –Thermal –Nuclear. By Cade and Georgia.  Newton’s laws of motion, including an understanding of force, mass and weight, acceleration and inertia applied to sport and physical. Momentum and Impulse So far we’ve studied the properties of a single object; i.e. its motion and energy How do we analyze the motion of two or more objects. Fall Final Review WKS: WORD PROBLEMS. Average Speed 1. A rock is dropped from the top of a tall cliff 9 meters above the ground. The ball falls freely. Module 11 Movement and change. Conservation of Energy Energy is Conserved!. The total energy (in all forms) in a “closed” system remains constant The total energy (in all forms) in. Surface Gravity Objects on the Moon weigh less than objects on Earth This is because surface gravity is less –The Moon has less mass than the Earth, so. © Houghton Mifflin Harcourt Publishing Company Preview Objectives Definition of Work Chapter 5 Section 1 Work.